Architecture and design bureau Luxury Antonovich Design is a world leader in the service sector in Umm al-Quwain. During this time, our architectural and design company has gained a decent customer base and work productively with the developers in Umm al-Quwain. Architecture and design bureau Luxury Antonovich Design is an independent organization, we have a strong partnership with the builders. The quality of our engineering solutions in Umm al-Quwain meets the world`s requirement. Contemporary architecture and design are the real art. Our projects of residence buildings have a unique appearance, their internal and external appearance corresponds the priorities and requirements of the customer. Our bureau will perform the architectural design of buildings completely, carry out the supervision, as well as create a unique interior for the customer. Our projects of public buildings correspond at most to an appropriation and image of the customer company. Restaurant, entertainment center or a shopping mall, which has designed by our company, integrated straight into the city architectural ensemble. Our architectural and design bureau is working closely with industrial entities, for which, it was created a large number of projects. Keeping the functionality and practicability, our specialists always try to give a visual allure and aesthetic qualities. 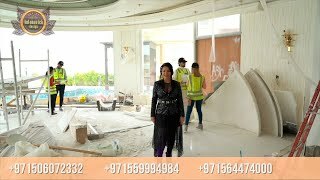 At the beginning of the existence Luxury Antonovich Design in Umm al-Quwain was successfully engaged in the design of the interior, both private and public buildings. Our projects of interiors are considered the examples of design art, among them, there are no two identical or just similar interiors, and they are all unique. We create an individual design in everything, even in the standard elements of buildings that does not absolutely affect on the quality and safety of the project. One of the often-solved problems by our bureau is designing of the residential complexes. Our specialists create a unique life environment for our customers, maximum conserving the environment and landscape. Your house will be one only and unique. We will be always happy to meet and communicate with our potential customers in Umm al-Quwain!